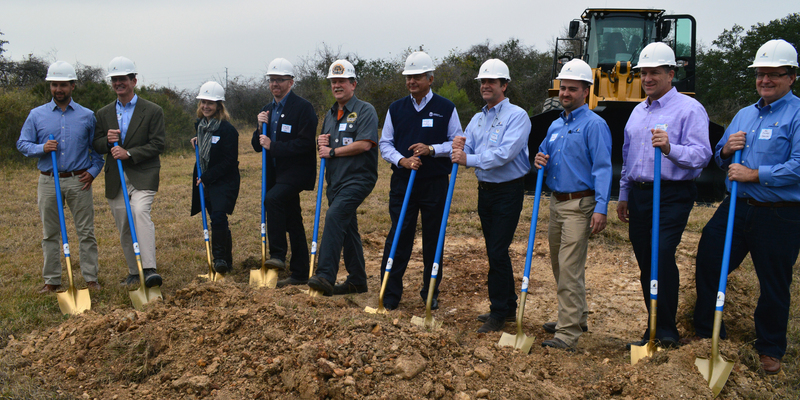 AUSTIN, TEXAS - To celebrate the future home of the Live Oak Brewing Company, Capital CDC hosted a groundbreaking ceremony on December 3, 2014 at the future site of LOBC, in coordination with Commerce National Bank and Structura General Contractors. Live Oak Brewing Company plans to erect a 22,000 SF building on the site to house the new brewery which will include a custom German-built brewhouse, millroom, lab, cold storage and distribution facilitites. And, for the first time in their 17 year history, Live Oak will be packaging their products in a convenient 12 oz can! “We didn’t want to rush into anything”, explained owner Chip McElroy. New state laws give Live Oak the opportunity to showcase their brewery in a retail setting. Consequently, they will provide a tasting room and a large beer garden beneath the shade of stately live oak trees for their beers to be enjoyed. There are other shady live oak groves on the property that will be available for family gatherings, weddings or other parties. The new facility will be located on 22 acres perched above the Colorado River north of Austin Bergstrom International Airport. Dr. McElroy started Live Oak 17 years ago with former business partner, Brian Peters, who is now brewer and co-owner of Austin Beer Garden Brewery. McElroy purchased the land in 2008 in anticipation of future growth. “I fell in love with the land the minute I saw it. Beautiful motts of live oaks all over the land, directly on the Colorado – it is a dream property.” There is a significant amount of area on the property still open for development of Live Oak’s future plans. “We want to make this a destination for natives and visitors alike, especially since it is so close to the airport. It will be the perfect place for tourists to start off and end their visit to Austin - observing native Austinites in their natural habitat – under shade, next to water, with a beer in their hand.” said Dr. McElroy. Currently, Live Oak Brewing Company makes a total of 16 beers that are distributed by beer distributors in the greater Houston area and self-distributed throughout Austin, Central Texas, San Antonio and the DFW area to restaurants, bars, and off-premises retailers. With the addition of the canning line, LOBC plans to expand distribution to grocery, convenience and package stores in the fourth quarter of 2015. More information about Live Oak Brewing Co. and their beers can be found at www.liveoakbrewing.com.